Bookride: The Eye of the World. 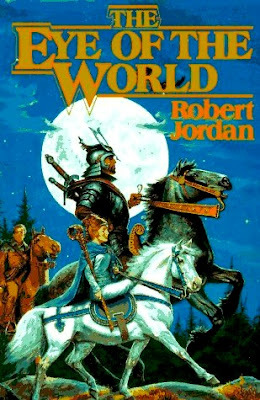 Robert Jordan, 1990. I came across this book in a very useful list compiled by an assiduous ebayer which was part of an endless thread "A Book that Looks Like Nothing" ( very long list try here.) Here is the accumulated wisdom of 'one short decade' on ebay, a sharp learning curve with a few no hopers and netblown books thrown in. A long queue await 'Eye' at ABE presumably looking for underpriced examples. Btw the Wikiman informs us that: ' Robert Jordan has stated that he consciously intended the early chapters of The Eye of the World to evoke the Shire of Middle-Earth in J. R. R. Tolkien's The Lord of the Rings.' Jordan is a US author and the US eds usually precede. His real name is James Oliver Rigney, a decorated Vietnam Vet and '... a history buff ... enjoys hunting, fishing, sailing, poker, chess, pool and pipe collecting.' A word of warning - pipe collectors can become shocking bores when you get them on their subject. This book seems to be quite common and still in print. Can you give the points for the 1st issue? I don't have a first ed, just a regular paperback but I did get it autographed. Now that RJ has passed on, any ideas what this book might be worth?